This year's event takes place on Sunday night, but while most of us enjoy finding out who's won best actress or best picture, fewer people than ever have been actually tuning in to watch the telecast. Last year, the ceremony's live audience was the lowest in in Oscars history, averaging 26.5 million viewers, down from 32.9 million in 2017. The increased competition from streaming services will certainly have played a part - but it's also likely to be audience fatigue at how bloated the three-and-a-half hour ceremony has become. "The first Oscars took less than 10 minutes," points out Scott Feinberg of The Hollywood Reporter, "which was obviously pre-television. "Television came along, and networks paid a fortune for the Oscars, and as a result they expected a more complete kind of show. "That meant no longer just handing out the awards but adding performance elements, so it became more telegenic, to include singing, dancing and comedy." Consequently, the Academy had this year attempted to bring some changes to try and keep audiences tuning in - most significantly by shortening the length of the telecast to three hours. But they've since had to row back on nearly all their time-saving decisions due to pressure from the film industry. But, suggests Feinberg: "That would've been really risky. "During commercials, when people at the ceremony know they're not live on the air, they run around and talk to people, go to the bathroom, be a little loud, and that could've come across as disrespectful to the winners who are getting their awards during that time." So the Academy reinstated the categories, and told its members last week: "All awards will be presented without edits, in our traditional format." After Kevin Hart's departure, the Academy confirmed this year would instead just have a mixture of celebrities introducing individual categories. It means the opening monologue from the host will be skipped, also saving time, but it's unlikely the ceremony will launch straight into handing out awards. "We have a very exciting opener planned. We are not going to go straight into people thanking their agents," she said. At the Academy's annual luncheon last month, nominees were told they'd have 90 seconds from the time their name is called until when their speech will need to be a concluded. "It means you can hit the parties by 8:15," Oscars producer Glenn Weiss pointed out. In his 10-point plan to save the Oscars last year, Piers Morgan suggested the Academy should "slash the musical performances in half and get rid of the best song category". But the Academy confirmed it wouldn't be cutting any of the songs - so this year's nominees, including Lady Gaga, will perform as normal. The only absentee from the best song performances will be Kendrick Lamar - who dropped out earlier this week due to logistical issues. 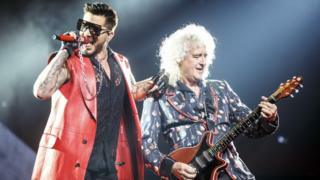 Not only will four of the best song nominees perform - but there will be a bonus musical performance Queen and Adam Lambert, the Academy announced last week. They're being included because one of the nominated films this year is the band's biopic Bohemian Rhapsody. Another of Morgan's suggestions was: "Stop giving the best picture award to obscure films very few non-movie people actually see, like or understand." In 2017, for example, the hugely popular La La Land, which grossed $440m (£334m), lost out to Moonlight, which took less than a fifth of that - $65m (£49m). "If you look at the numbers over the years, the ratings closely correlate to the popularity of the best picture nominees, because then people feel they have a rooting interest in the outcome," says Feinberg. "Last year, it's not surprising the ratings took a hit because Three Billboards and The Shape of Water were not the films the audiences were going to in big numbers. "If they'd nominated something like Wonder Woman, I think the numbers probably would've been a little better. This year, they have a lot riding on Black Panther. "It's important for ABC, the Academy, Disney, that Black Panther not be snubbed." Black Panther's popularity is perhaps one of the reasons the Academy attempted to introduce a new category this year to recognise more box office hits. But this turned out to be another decision they would backtrack on - blaming the complications of introducing a new category so late in the year, when studios hadn't had time to prepare or target their promotional campaigns towards awards season. It also would've meant yet another category to get through on the night - and most agree the Academy certainly doesn't need any more of those. "Over the years the number of categories at the Oscars has grown," says Feinberg, "and it's much easier to add categories than it is to take them off the air. "And that's because once a category is on the air, the people who would be affected by it don't want to lose that potential air time for their area of work."